Dirk Meyer pwns Intel, whose Nahelem chip will get smothered before it could take a healthy breath out of the bushes of old double-cheeseburger designs. Intel customers had to switch boards, memory, cables and re-install the OS. 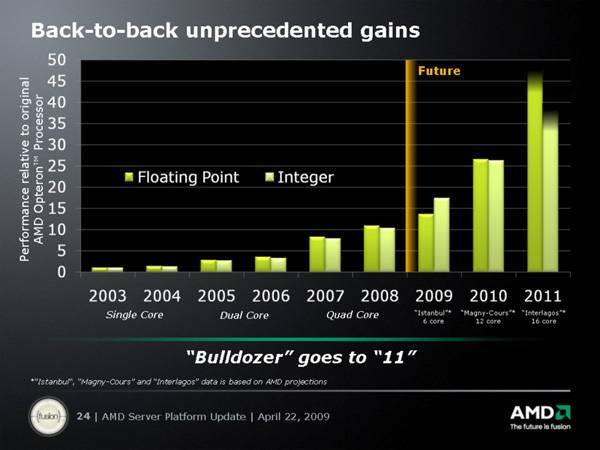 AMD's six shooter is plug n play. Take an existing socket F Opteron server, you can swap in the 6-core Istanbul, and there you go. The 12-core version had been sampled and shipped to vendors for testing. With AMD's glueless 8-way SMP, that enables 96-P computing. The 16-core next generation Opteron is not far away either. Intel engineers will have more sleepless nights reading those 1000-page AMD pdf documents.